Left it quite late for this weeks Islay blogging roundup, but then I've been away for a very nice afternoon at Hurst Castle (that's on the south coast of England, between Bournemouth and Southampton). Didn't get home until fairly late, but after my dinner and blogging about the afternoon it's now back to Islay with a wee dram of Laphroaig Quarter Cask. What have the blogs been writing about Islay this last week? Let's start with a bit of walking: Becky has been out and about again, walking from Coillabus to Beinn Mhor. This is a great walk, I've been on a similar walk on The Oa to Beinn Mhór (part 2) two years ago, the views are just amazing. Ian and his helpers had quite a bit to report this week, among others an update about the choughs (with picture), the tally of the previous weeks Goose count and a Purple Sandpiper. 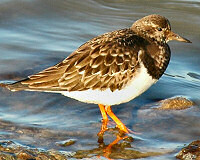 No picture of the Turnstone though, so I thought I provide my own (not from Islay, but the south coast). Jeremy in the meantime reports of a Raven and Rabbit, including a sunset looking very similar to the one I saw today. Earlier in the week he told us about White Fronts and World on the move. You can read more also at Ron's Islay Wildlife and Birding Report 6 - Sunshine all the Way. Ron also points out an interesting new Islay site in Portnahaven and Port Wemyss Nostalgia, the site is Portnahaven by Tom Graham. Same as me he picks up on the Islay DVD Movie by Gordon Yates. The Bruichladdich Blog (with new URL) writes about the Valentine’s Spirit and points out Bruichladdich is a Luxury Malts. Or may be not. Not sure if this should be counted as a blog, but I don't think I should leave it out anyway: The Ardbeg Sausages sound quite interesting, unfortunately I doubt I can make these myself. That's all I've got for this week, I need to get to bed to get some sleep after all that fresh sea air this afternoon. As usual not before pointing you to the Scottish Roundup for the bigger picture, today with Borders and Boundaries. Good night!